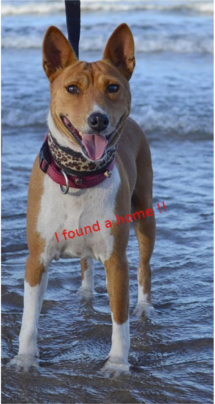 BENJI (TARAMAHA STEVIE WONDER) – male red & white, Basenji. Desexed and microchipped. Introducing Benji – this handsome boy is energetic and very loyal. Sadly Benji’s owner is now too old to give her faithful friend all the activity he needs, so we are searching for his new family. One of Benji’s best friend from his previous family was a Dachshund, so Benji is well socialised with other dogs, however he isnt too fussed on fluffy or small canines and cats. Benji is being cared for by a BBNA foster carer who is giving him the royal treatment with hydro-bathing, nail clipping, brushing, and teeth checks weekly. While Benji loves the attention of female handlers, he is a bit timid of males, however in his foster home he is living with male and female carers. He loves walking on a lead and riding in the car. Benji has lots of love to give and at only 6 years of age, he also has a long time left to love a special human. See more about Benji HERE.